Are you sitting at your kitchen, looking at a stack of bills, thinking “there is no way I am ever going to have enough money to pay off all of this debt.” If so, you are not alone. If you are like many of our honest, hardworking clients, you, too, may conclude that the bankruptcy law may be your best solution to harassing creditors, overdue bills and the threat of foreclosure, repossession or wage garnishment. In 2017, the year just past, over 29,000 people filed for bankruptcy protection in the Northern District of Georgia. In 2016, over 32,000 people filed. Based on statistics released by the Clerk of Bankruptcy Court for the Northern District of Georgia, around 500,000 people have filed bankruptcy over the past 10 years. Given that there are about 5 million people in the Atlanta metro area, this means that about 1 out of every 10 north Georgia residents has filed a Chapter 7 or Chapter 13.
can send you spiraling over the edge of solvency. what does it mean to seek relief under the bankruptcy laws? are there legitimate alternatives to bankruptcy? You’ll find the answer to all of these questions on this web site. You are also invited to call Ginsberg Law Offices at 770-393-4985 to speak with either attorney Jonathan Ginsberg or attorney Susan Blum for advice specific to your situation. Bankruptcy, when used as a financial tool, can serve as a reset button. It can give you a second chance and a do-over. More importantly, bankruptcy can give you back your peace of mind – your capacity to sleep though the night and to escape that perpetual bad mood. On this web site, you will discover the answer to these and other questions Susan and I answer every day. One thing for certain – legal debt relief under Chapter 7 or Chapter 13 is not a one size fits all solution. Some cases last 5 months and some cases last 5 years. Usually we can file a case in which you do not have to give up any of your property, although sometimes you may choose to surrender a house or a car to cancel the payment obligation. As an Atlanta bankruptcy attorney for the past twenty-five years, I have come to understand just how difficult it will be for you to make that call to me about filing a bankruptcy case. Attorney Susan Blum, who joined Ginsberg Law Offices as as of counsel attorney several years ago, joins me in encouraging you to call our office at 770-393-4985 if you think that filing may be an option. We have represented hundreds of Chapter 7 and Chapter 13 clients and have successfully guided these clients through the bankruptcy process in Atlanta and nearby bankruptcy filing districts of Gainesville, Newnan and Rome. When you become one of our clients, you will meet one-on-one with the attorney – not a paralegal or legal assistant – to discuss the financial problems you are facing. And whether you decide to file bankruptcy, or pursue a non-bankruptcy alternative, you will feel a sense of relief knowing that you more clearly understand the bankruptcy process and whether filing makes sense for you. Most of the people I see say things like “I never thought I would be in this position” or “this is the most embarrassing and difficult decision I have ever made.” I want to reassure you that when you contact Susan or me, we will treat you with courtesy and respect and that we will treat the information you provide to us n strict confidence. While bankruptcy serves as a powerful tool to address debt problems, it is not the only solution. When you call, we will discuss both bankruptcy and non-bankruptcy alternatives. If we agree that bankruptcy makes sense for you, there are two parts to filing – first, we must prepare and file your paperwork; second – when your case is over, you will need guidance from us about how to restore and rebuild your credit. We will help you with both of these services. Our fees are reasonable and a lot less than downtown law firms, but we are not a discount legal clinic. Susan or I will quote a price for your case based on the facts of your case. The law now requires us to gather a great deal of documentation about your income, expenses, assets and debts. No longer can you file a case without first producing documents including past year’s tax returns, copies of pay stubs, and proof of expenses. I have set up a page on this web site called Just Starting to Look that sets out exactly what I need to analyze your debt situation. You can then fax us your package of information (fax is 770-393-0240) and we will review at no charge. You can also drop your package by our office. Most people considering bankruptcy have a lot of questions. You may have very little experience with court proceedings of any kind and now you are thinking about filing a 50 page petition that will become part of a public record containing information about your income, your debts, your assets and what you spend every month. What privacy rules apply? Will your employer, relatives and friends find out that you have filed? Will you ever recover from this embarrassing experience and qualify for a mortgage, car loan or credit card? These questions are very relevant and you deserve truthful and accurate answers. You also deserve the attention of a lawyer who will take the time to learn what you have been through, answer your questions and treat you with respect. Although Jonathan and Susan see bankruptcy as a last resort, we also recognize that sometimes unpleasant or unexpected things happen to good people. In our practice, we see men and women from every walk of life – including teachers, administrative personnel, managers, professionals (doctors, lawyers, engineers, accountants). You can be certain that no matter what your situation, you will always be treated with professionalism and respect and that any information you provide will be kept in the strictest of confidence. The Atlanta bankruptcy lawyers from the Ginsberg Law Office can help clients with Chapter 7 and Chapter 13 cases. 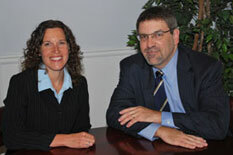 As experienced Atlanta bankruptcy attorneys, the Ginsberg Law Office has been helping clients in Atlanta for 25 years. Call our Atlanta bankruptcy attorneys at 770-393-4985 for your consultation today! Just Starting to Look or Ready to File…Either way, we can help! As you might imagine, I receive a lot of phone calls every day from people who are facing debt issues and have some questions about bankruptcy. Several of these callers have been reluctant to download and fill out a long form questionnaire. I understand this concern and to address it, I created a simple two-page worksheet that should give me enough information to speak with you. I urge you to call or e-mail before you try any desperate measures like raiding your retirement plan, transferring property, or transferring credit card balances. Although I can deal with these actions, you are usually better off not taking these steps. I would rather hear from you sooner rather than later. I also recommend that you contact me if you have been sued or if there is a pending judgment. When a judge issues a judgment the underlying debt becomes a secured debt and can be satisfied by seizing bank accounts, garnishing wages or liening property. While I can sometimes get rid of judgments in a bankruptcy, you are better off avoiding them whenever possible. Please take a few minutes to read the information on this web site and to watch the videos I have posted. Bankruptcy is a big decision and Susan and I want you to be both informed about bankruptcy law in Georgia and we want you get a sense about how we practice. If you would like to learn more about Atlanta bankruptcy law, I invite you to call or email for free information about Chapter 7 law and Chapter 13 law, the rules that identify the property you can exempt (protect) when you file using Georgia’s bankruptcy exemption statute (Section 44-13-100 of the Official Code of Georgia), and how you can rebuild your credit after filing. Jonathan and Susan are here to help you decide if the right decision for you and your family involves a Chapter 7 or Chapter 13 bankruptcy. Under the Title 11 of the United States Code, law firms like Ginsberg Law Offices, P.C. that represent consumer debtors have been designated as “debt relief agencies.” This means that we help people file for bankruptcy relief under the Bankruptcy Code.